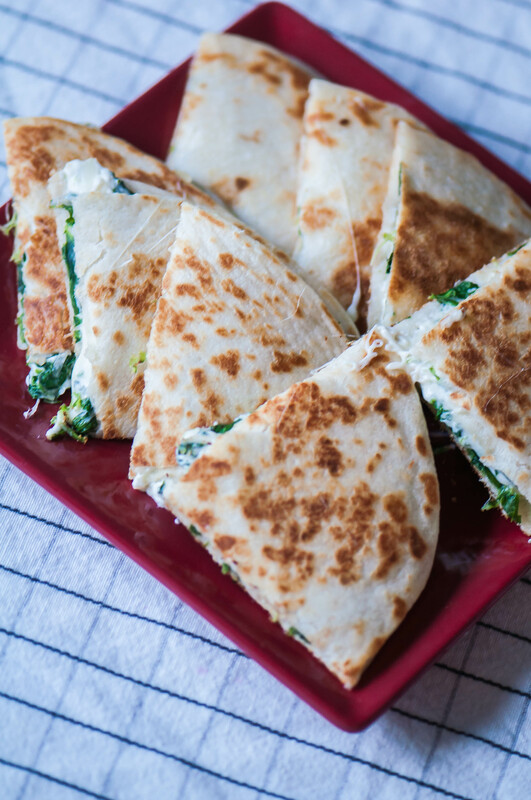 Turn your favorite dip into a meal with these Spinach Artichoke Dip Quesadillas. In less than 30 minutes, you’ll have a fun dinner or great game day appetizer. Who else uses quesadillas as a dinner go to? We always have tortillas and cheese in the house because we are good human beings and you never know when tacos might need to happen. Or quesadillas in this circumstance. You can basically throw anything in a flour tortilla with some cheese and guarantee it’s going to be good. I use this dinner strategy often when I don’t feel like cooking or want to use up some leftovers in a different way so my people don’t actually know they are eating leftovers, #momwin. Barbecue chicken and sloppy joe’s have been some of our favorite thrown together creations. So as you can tell by now, quesadillas happen often in our house and they are something I think of often when I’m working on recipe development. You know what else I think about often? Appetizers. Joel and I had a date night a few weeks ago and we had appetizers for dinner. That’s how deep my love runs for them. And that’s when inspiration struck. Why not combine two favorite appetizers, quesadillas and spinach artichoke dip, into the ultimate snack or dinner. I promise you I only share recipes that I’ve created, tested and love but some are just on a different level and this is one of them. These.Are.So.Good. Plus, every picky person in my family liked them. Loved them. Ate them without complaint. If that’s not winning I don’t know what is. The simple to make filling is super creamy with the perfect ratio of spinach and artichokes combined with three different kinds of cheeses. Yes, THREE! Cream cheese brings the creamy texture. Parmesan brings some bit and mozzarella lends all the stringy, gooey goodness. Once the quesadillas are assembled they are cooked in butter until golden brown. You only need about 15 minutes to make these Spinach Artichoke Dip Quesadillas which makes them a great option for game day appetizers or crazy busy weeknight meals. I mean, what more could you want? Preheat skillet over medium heat. Over the sink, squeeze thawed spinach until liquid no longer comes out. You can do this with your hands or place it in a kitchen towel and ring it out. It may stain the towel so use one you that can be stained. In a large bowl, combine the spinach, cream cheese, chopped artichokes, parmesan, mozzarella, garlic, salt and pepper. Spread mixture evenly between 4 to 5 flour tortillas (depending on how full you want them). Top each with another tortilla. Set aside. Melt 1 teaspoon of the butter in the skillet and add 1 prepared quesadilla. Cook until golden brown, 1 to 2 minutes, then flip and cook an additional 2 minutes. Remove from skillet and slice with pizza cutter. Cook remaining quesadillas, adding more butter when needed.